Kitchen storage jars canister set. Premier Housewares Sugar Canister Cream. Sugar storage canister from the Liberty range from Premier Housewares. Brushed stainless steel airtight lid to ensure contents stay fresh. Great gift ideas. Beautiful roll-top bread bin with 3 matching canisters. Beautiful roll-top bread bin and matching tea, coffee and sugar canisters for your kitchen. 1 BREAD BIN AND 3 CANISTER SET. 1 Bread Bin and 3 Canister Set. Marke Brabantia. Farbe matt steel/ deckel matt schwarz., L'utilisation fonctionnelle durable et un design intemporel. Höhe 28 cm. This is designed to maintain your food freshness for longer period of time. High quality stylish design biscuit storage jar. Manufactured from top quality fingerprint proof stainless steel and copper material. Including air tight lid with handle on the top which help to open the lid very easily and smoothly. This is suitable for classic or modern style kitchen. Product dimensions including Lid : 20 x 14cm. Stainless Steel Bread Bin And Storage Canister Set. 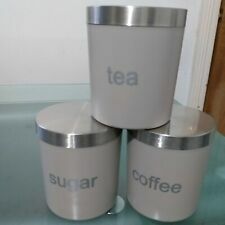 Tea, Coffee, Sugar Canisters With Bread Bin. Bin - 44cm Wide x 26cm Deep x 17cm High. Colour : Red. The Republic of Ireland & The Channel Islands. Easy Clean High Quality. Premier Housewares Sugar Canister Black. Sugar storage canister from the Liberty range from Premier Housewares. Brushed stainless steel airtight lid to ensure contents stay fresh. Great gift ideas. Premier Housewares Coffee Canister Cream. Coffee storage canister from the Liberty range from Premier Housewares. Brushed stainless steel airtight lid to ensure contents stay fresh. Great gift ideas. Westmark a été fondée en 1923 à Herscheid. de WESTMARK. Marke Westmark. Stil Landhaus. Material Edelstahl. Farbe Silber. EAN 4004094124563. Art Einmachtrichter. Made from stainless steel with a brushed bronze finish. Brushed Bronze Canister Set. Set of 3 Canisters by Flying Tiger. New with labels. This 3pc Square Cream Canisters from Apollo Housewares will keep your products fresh for a longer period of time. Made from stainless steel material, these canisters are durable and practical. Easy to clean and not suitable for dishwashers. This Grey/Copper Sugar canister from Typhoon will bring elegance in your kitchen. Made from durable coated steel material with lid which keeps your product safe and fresh all the time. 3PC GLASS JAR CANISTER. PERFECT FOR TEA COFFEE SUGAR. Here you?ll find the latest and greatest products. In other words ?. When you order from us, you?ll always get a great product at a great price. L'utilisation possible de la Super Ball sont fixés. Wesco Superball en acier inoxydable. Marke Wesco. Matériel: tôle d'acier thermolaqué, acier rond de haute qualité chromé. Vous recevez la marchandise avec une facture indiquant la TVA. This glass jar's screw-on lid creates a tight seal, making it suitable for extending the shelf life of dried food. Its blue finish coordinates with the steel that covers the upper section, the lower section left exposed to make it easy to check when its contents are running low. With an 800ml capacity, it's ideal for storing coffee, pasta, or rice. Finished with a navy blue 'SUGAR' text print, it's easy to identify what's in the container from a quick glance. This is great if you have the other Steel Storage Tins from the Kitchen Craft Living Nostalgia collection. Apollo Housewares Tea Canister: This is designed to maintain your food freshness for longer period of time. High quality stylish design tea storage jar. Manufactured from top quality fingerprint proof stainless steel and copper material. Including air tight lid with handle on the top which help to open the lid very easily and smoothly. This is suitable for classic or modern style kitchen. Product dimensions including Lid : 16cm x 10cm. 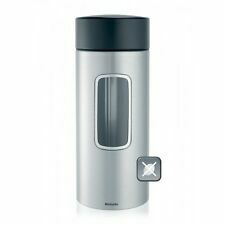 Apollo Housewares Coffee Canister: This is designed to maintain your food freshness for longer period of time. High quality stylish design coffee storage jar. Manufactured from top quality fingerprint proof stainless steel and copper material. Including air tight lid with handle on the top which help to open the lid very easily and smoothly. This is suitable for classic or modern style kitchen. 3PC STAINLESS STEEL GLASS CONTAINERS. COFFEE TEA SUGAR ETC. Here you?ll find the latest and greatest products. In other words ?. When you order from us, you?ll always get a great product at a great price. 4PC STAINLESS STEEL GLASS CONTAINERS. COFFEE TEA SUGAR ETC. Here you?ll find the latest and greatest products. In other words ?. When you order from us, you?ll always get a great product at a great price. Each jar is made from water and scratch-resistant enamel, with a cool blue finish that allows the silver toned lettering to stand out clearly. Their satin stainless steel lids coordinate with the lettering, and pop into place securely thanks to the ridged rim on each jar. Keep them clean by washing them in warm soapy water. This is designed to maintain your food freshness for longer period of time. High quality stylish design coffee storage jar. Manufactured from top quality fingerprint proof stainless steel and copper material. Including air tight lid with handle on the top which help to open the lid very easily and smoothly. This is suitable for classic or modern style kitchen. Product dimensions including Lid : 16cm x 10cm. A must have accessory for every kitchen. 5 snap on lids. Great Range of Products. Great Price & Value. We will always do our best to resolve any issues. Genuine & Authentic. More than simply keeping your biscuits fresh for longer, the stylish contemporary biscuit canister will add an elegant touch to your kitchen. Biscuit Canister. A satin stainless steel lid fits securely on top ensuring your biscuits, sweets and cookies are kept fresh. Tea storage canister from the Liberty range from Premier Housewares. Premier Housewares Tea Canister Black. Brushed stainless steel airtight lid to ensure contents stay fresh. Great gift ideas. Fabricant: Ambition. Le bouchon garantit une parfaite étanchéité du récipient. Producteur: Ambition. Épaisseur [cm] Diamètre [cm]: 9.5. Capacité [ml]: 1000. Profondeur [cm] Hauteur [cm]: 17.5. 4pcs Bread Bin Tea Coffee Sugar Jars Set. Keep Your Kitchen Tidy And Food Fresh For Long. Sleek Design. Apollo Housewares Biscuit Canister: This is designed to maintain your food freshness for longer period of time. High quality stylish design biscuit storage jar. Manufactured from top quality fingerprint proof stainless steel and copper material. Including air tight lid with handle on the top which help to open the lid very easily and smoothly. This is suitable for classic or modern style kitchen. Product dimensions including Lid : 20 x 14cm. Apollo Housewares Pasta Canister: This is designed to maintain your food freshness for longer period of time. High quality stylish design pasta storage jar. Manufactured from top quality fingerprint proof stainless steel and copper material. Including air tight lid with handle on the top which help to open the lid very easily and smoothly. This is suitable for classic or modern style kitchen. Here you?ll find the latest and greatest products. In other words ?. When you order from us, you?ll always get a great product at a great price. MATERIAL BREAKDOWN: 100% STAINLESS STEEL. Want to get in touch?. CUILLERE EN ACIER STIANLESS: Nos cuillères sont fabriquées en acier inoxydable de haute qualité, ne se plient jamais et ne rouillent pas. Ne craignez pas non plus la peinture, mais très durables. Matériel: acier inoxydable. This Coffee canister from Typhoon will bring elegance in your kitchen. Made from durable steel material with bamboo air tight lid which keeps your product safe and fresh all the time.